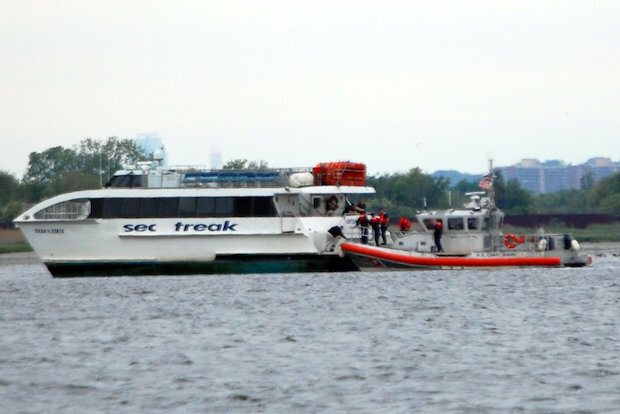 QUEENS — A ferry testing out a route from Far Rockaway to JFK Airport Wednesday afternoon ran aground in Jamaica Bay, trapping those aboard for nearly an hour, Coast Guard officials and passengers said. There were 25 passengers aboard when the boat got stuck in the Winholme Channel at 1:20 p.m. — including pro-ferry advocates, a representative from the Borough President Melinda Katz's Office, as well as four crewmembers, officials said. None were injured in the incident, Coast Guard spokesman Charles Rowe said. Rowe said firefighters arrived at the ferry, operated by Seastreak and dubbed the Ocean State, just after 2 p.m. They removed those aboard and transported them to the Rockaway Ferry Terminal, he said. Passengers were also brought to The Wharf restaurant on Beach 116th Street, according to witnesses. The Coast Guard is investigating why the boat got stuck in shallow waters, Rowe said. Passengers on Wednesday's voyage said crew members told them the vessel may have run aground on a sandbar churned up after Hurricane Sandy — adding that existing maps of the seafloor haven't been updated to reflect changes in underground sand barriers caused by Sandy. The incident was reminiscent of the the ill-fated voyage of the S.S. Minnow from Gilligan's Island. "It turned into the three hour tour but we were all right," passenger Maureen Walsh, 53, said, adding that the crew tried to rock the boat free by moving passengers to one side in order to shift the weight. “They were very professional. Nobody ever felt threatened,” she said. The Ocean State has two decks, a bathroom and full bar service, according to Seastreak's website. Seastreak did not immediately comment on the incident.